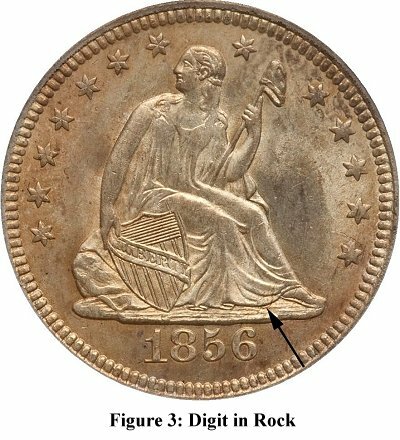 The many varieties of seated quarters, particularly amongst the early dates in the series, provide a great deal of material for numismatic study. There are times, however, when one has to wonder if the people who prepared the dies were blind, or drunk, or both. One case in point is the 1856 Philadelphia quarter. 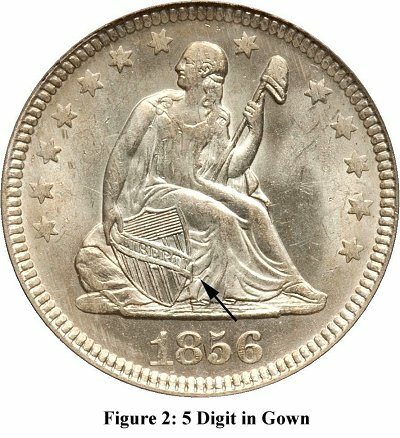 Larry Briggs, in The Comprehensive Encyclopedia of United States Liberty Quarters (Lima, OH 1991), listed one misplaced date for the 1856. Since publication of the book, three more have been identified with, given the high mintage of 7,264,000, the possibility of more to be found. 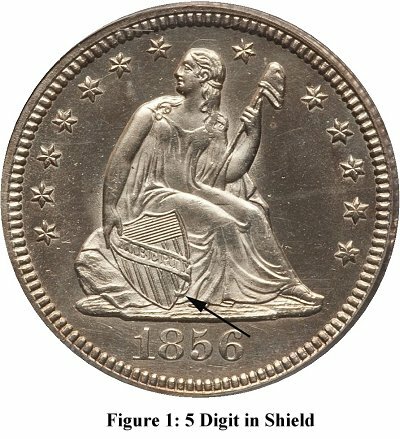 The listed variety is Briggs’ die pair 9-G. Obverse 9 has the flag of a 5 in the shield (Figure 1) and is a very rare coin. The second MPD, which appears to be fairly common and is becoming well known, has the flag of a one in Liberty’s gown (Figure 2). 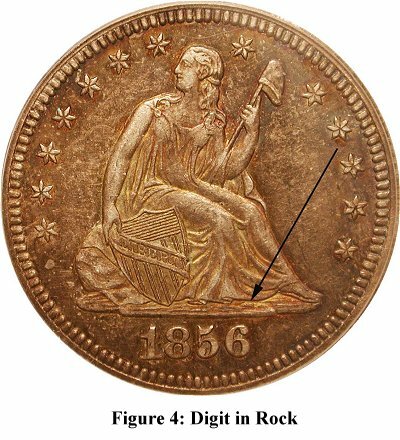 There are also two distinct obverse dies that have what appears to be the loop of a misplaced six in the rock (Figures 3 and 4). Little appears to be known regarding these varieties, including their rarity, but we do have a couple more neat coins for which to be searching.